Knowing our industry and its links can be very stressful at times, we all like to blow off steam every now and then. 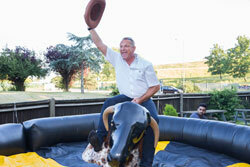 The Westbay Summer Party is just the place to do it. Too many people are busy during the Christmas period and don’t often get the time to attend all the social functions they get invited to. It is with this in mind that we decided to hold a summer party, not only is the weather better but more people tend to be available. Because most of our business is carried out over the phone it is an ideal event for everybody to meet up and “put a face to the name”. Provided below is just a small snippet of some of the various years when we were sober enough to have photos taken.